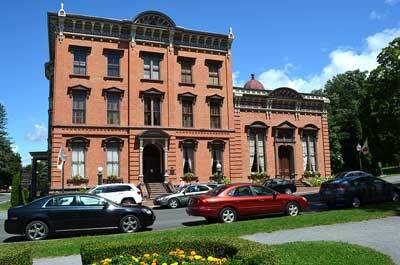 The Canfield Casino is one of Saratoga's most talked about landmarks. The Casino, originally dubbed the Saratoga Club House, was built by John Morrissey as part of Congress Hall, which was a large resort hotel that contributed to giving Saratoga Springs its fame as the Spa City. Morrissey, a well known professional boxer and member of Boss Tweed's Tammany Hall network, first came to Saratoga in 1861 and ran a gaming house downtown. He knew there was more money to be made, so Morrissey invested his own money in building what is now known as the Canfield Casino. Upon opening the Club House, Morrissey had only 3 rules - no ladies allowed, cash only, no locals. These rules allowed the club to take on exclusivity that made it one of the world's most renowned gambling houses. Not even the wealthiest could get Morrissey to bend the rules, which kept his Saratoga Club House open even when gambling was illegal for Saratoga residents. A few years after Morrissey's death, Richard Canfield took a partnership in the gambling establishment. Richard Canfield bought the venue in 1884 for a quarter of a million dollars and invested heavily in the building and the surrounding park to make the Club House even more appealing to affluent visitors from around the world. In its heyday, frequent visitors to the casino included wealthy members of the Whitney and Vanderbilt families, famous gamblers like Diamond Jim Brady and John Gates as well as a host of top-notch entertainers. This era of high-stakes gambling ended in 1907 when local reformers were finally successful in banning gambling in the city of Saratoga Springs. Canfield sold the casino to the village a few years later for less than he paid for it. Today, the Canfield Casino plays host to extravagant parties, elegant weddings and other events. 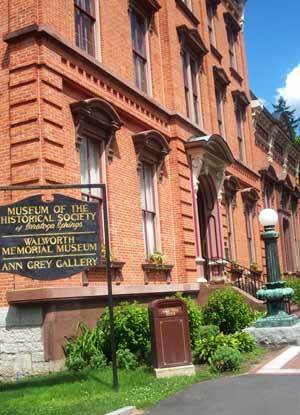 It is also home to the Saratoga Springs History Museum. The surrounding Congress Park is also available for outdoor wedding ceremonies in addition to being a local haven for recreation, including walking, jogging, picnics and more. Many think Canfield Casino is haunted by the glamorous men and women who partied the night away in the grand parlor or spent the evening betting on the various games of chance in the posh casino. The occasional spooky event has taken place at the casino for decades, but these have really escalated in the past 20 years. Some say an exhibit of clothing worn by the famous ladies of Saratoga was the catalyst for the increase in paranormal activity. Tales of hauntings note bats flying around at people's weddings, sudden drops in temperature, objects being moved in the night and apparitions of women dressed in Victorian clothing. There was so much activity from 2007 to 2010 that Ghost Hunters sent a team out in late 2010. Is Canfield Casino haunted? Who is haunting the famous casino? Is it the ghosts of locals past who were angry about not being allowed in the casino? The well-heeled ladies of the Victorian Era who made a nice dinner companion but couldn't enter the casino? The ghost of John Morrissey himself? Or.... someone else?